Today's pet artist is Fred Kessler, a craftsman from North Carolina who creates steel animal and plants. Fred says, "If I smile when I make something, and you smile when you see it, I've done my job." Well done, Fred! 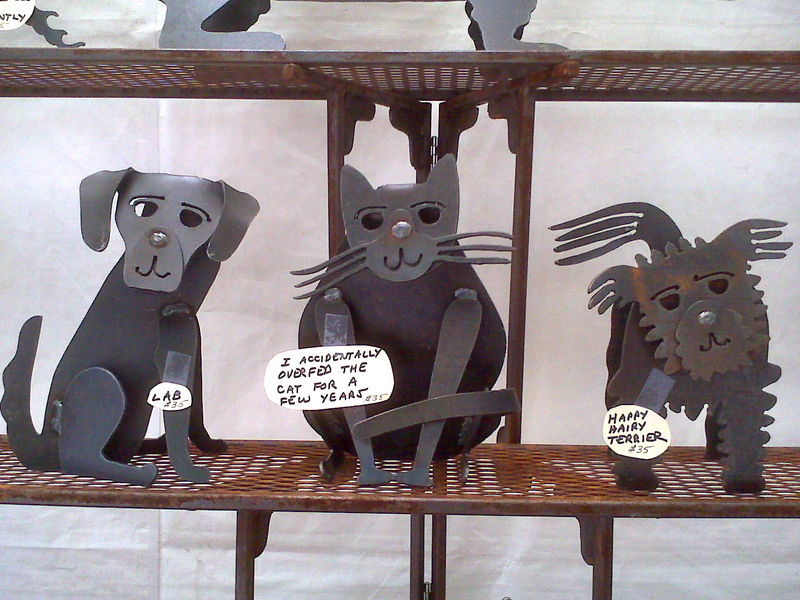 Not only did I smile when I saw the lovely steel animal sculptures in your booth, I'm still smiling everytime I look at one of these photos. The "captions" for each, make me smile everytime! Fred started building steel tug boats about 30 years ago. 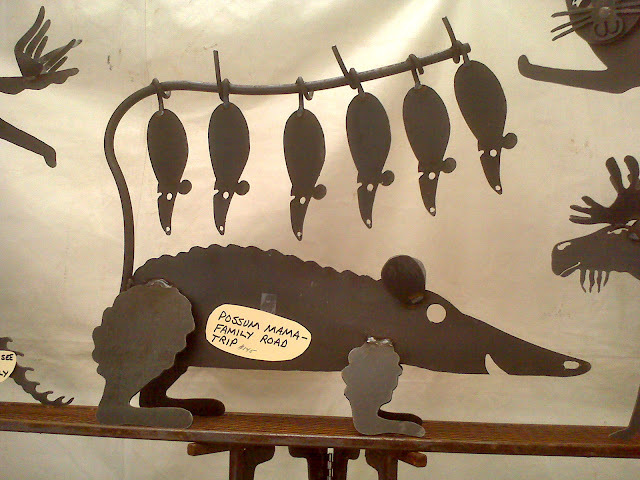 The work he does now evolved from cutting animals and plants out of scrap steel left over from boat building. Now, Fred and his wife Arlene take frequent trips into the swamps and rivers of the east coast on a small steel tug boat that Fred built. Fred says that many of the ideas for the pieces he creates come to him when he's on the water. Fred has been elected to lifetime membership in the North Carolina Guild of Craftsmen, and he says he marvels at how chance events in your life can lead you in new directions. Says Fred, "Treece Blanton, a 94-year-old cast net weaver from Georgia summed life up for me when he told me 'you choose to throw your net a little different and you wind up eatin' a whole different kind of fish.'" That's what I'm talking about! I so enjoyed meeting Fred and love his work! 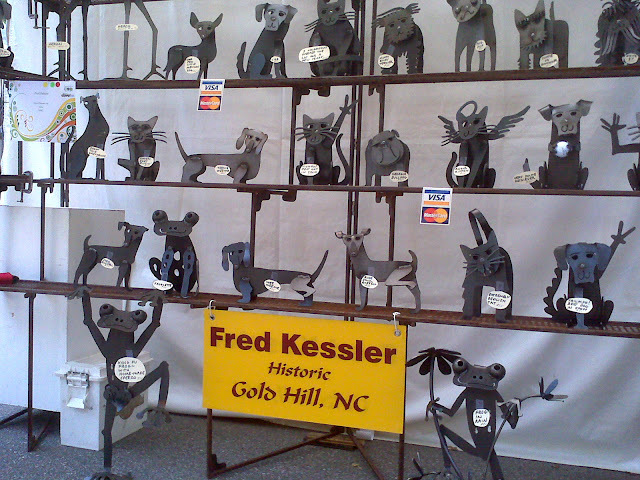 Fred and Arlene live in Gold Hill, NC and you can visit his work shop if you send him an email first at kessler@vnet.net. He also exhibits at shows but you'll need to email Fred to check his schedule. Nice! I commissioned something similar years ago in Denver, but with two heelers, for my sister. I wonder if it was the same artist? Wow really very nice and good information you share here. I read your entire post and good information.Thanks for sharing nice and valuable information.